Making a pivot turn with a single engine boat is not difficult. And mastering this technique can help get you out of a tight jam. Imagine that you’ve just cruised into a marina, space it tight, and you realize it’s the wrong marina. And the bulkhead is looming straight ahead. What do you do? Time for a pivot turn. Making a U-turn by turning the wheel all the way and putting the throttle in forward idle would likely require the space of at least two-and-a-half boat lengths to complete. In this situation, it’s unlikely that you’ll have enough room. The pivot turn allows you to change direction by essentially rotating on the spot. The technique is similar to performing a three-point turn (or K-turn) in a car. Keep in mind that while the technique remains essentially the same, no two pivot turns are exactly alike. The wind direction and speed, as well as current, will affect how long you leave the boat in gear and how many times you need to repeat the process. For example, if the wind is behind you and you’re forced to turn into the wind, you may need to change the wheel direction more quickly and stay in gear for shorter periods to keep the wind from pushing you off your pivot point. While performing the pivot turn, keep your head on a swivel. This means that you should look in the direction your boat is going (turn around when in reverse; look ahead when in forward), but also be aware of traffic and obstacles around you. It’s also helpful to pick a spot nearby, such as a piling, to use as a reference point to make sure you’re not drifting too far out of your pivot zone. 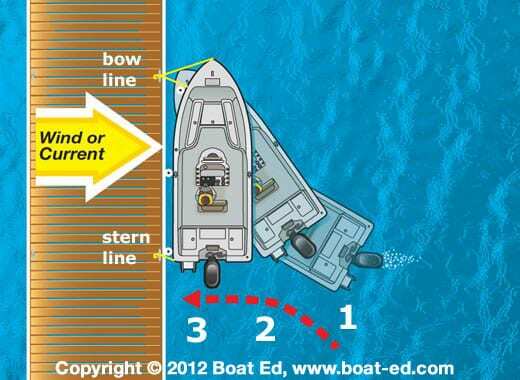 Here’s how to perform this simple maneuver on a boat with a single outboard or sterndrive. The key is to stay controlled and steady in your maneuvers. And remember: Slow is pro. Bring your boat to a complete stop. Pause in neutral, then shift into reverse idle. Look to the side so you can gauge your boat’s movement. Once the boat stops, shift into neutral. Take note of wind direction and use it to help you. If possible, keep your boat to the upwind side. For example, if the wind is blowing west to east, put your boat on the west side of the fairway to account for drift. Now, turn the wheel all the way left (counterclockwise). Shift into reverse idle for 3 to 4 seconds then back to neutral so the stern goes left as the boat slowly reverses. Assess how your boat is moving. Depending on how the wind is affecting you, you can leave the wheel turned and allow the rudder effect to continue turning your boat for a short period. Now turn the wheel hard in the opposite direction (clockwise in this case). Then shift into forward idle for 3 to 4 seconds, then back to neutral. You’ll notice the stern still goes to the left, but now the boat is moving a bit forward, continuing its clockwise rotation. Assess your movement. Allow the boat to continue to turn. If you need to, turn the wheel hard left (counterclockwise) once again, shift into reverse for 3 to 4 seconds, then back to neutral. After three to four maneuvers, your boat should be rotated 180 degrees from where you started the pivot turn. (Note: Sometimes a very brief but careful extra burst of power in the correct direction is needed to help the bow to swing.) Now put it in forward idle and get back on course.